This delapidated mountain home located on a stunning piece of property was dark and compartmentalized. 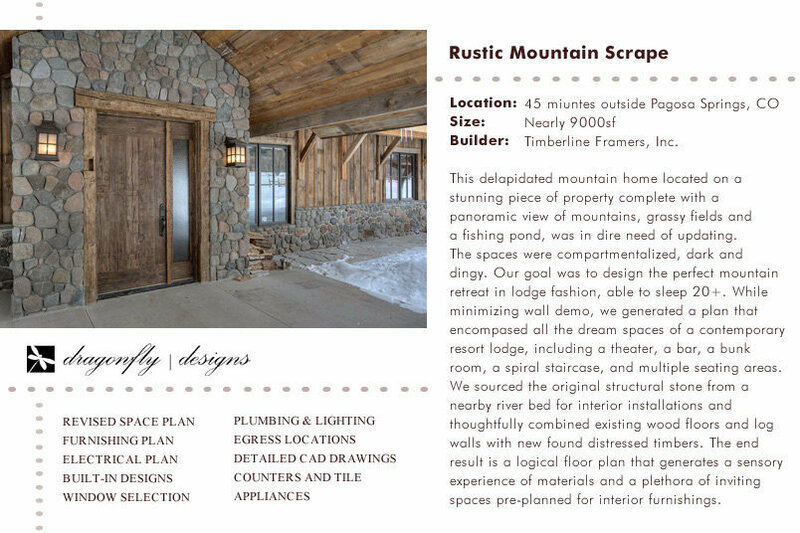 Our goal was to design the perfect mountain retreat in lodge style, able to sleep 20 . While minimizing wall demo, we were able to incorporate charming spaces such as a sports bar, a theater, a spiral staircase, two master suites, a bunk room and a butler's pantry. We sourced the original structural stone from a nearby river for interior installations and thoughtfully combined existing wood floors and log walls with newfound distressed timbers. The result is a logical floorplan that generates a sensory experience of materials, unique lighting and a plethora of inviting spaces - pre planned for interior furnishings.